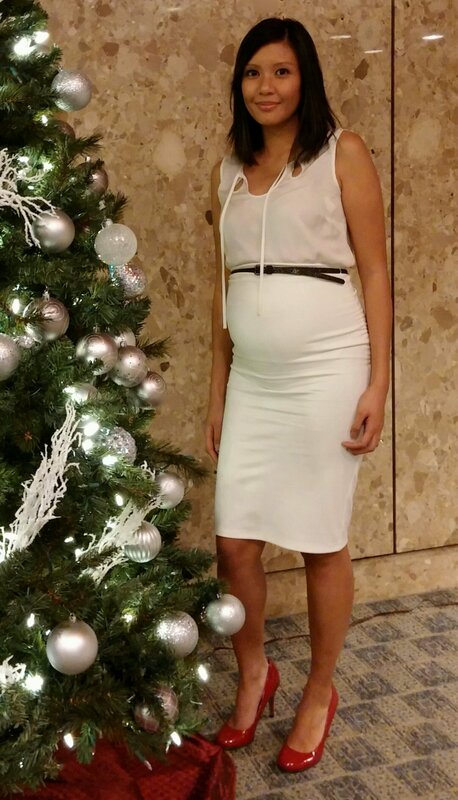 I tried out Megan Nielsen’s ruched maternity skirt pattern to wear at my company Christmas party. The pattern is extremely easy and fits very well. It took about 1.5 hours total. That’s it! I love it, however, I made the mistake of not following the pattern’s fabric suggestion. It says to use a knit fabric that stretches at least 40%. In other words, if you take 10 cm of the fabric, it should stretch to at least 14 cm. I was too lazy to head to the Queen St. fabric stores and just picked something up at my local Fabricland. My fabric stretch was about 25%, which means this skirt will not grow with me! I have another Megan Nielsen pattern that I’ll try out and review. I highly recommend all you pregnant ladies, check out her selection. The only place I found that sells these patterns in Toronto is The Workroom. I purchased mine from an online store. I went in for my monthly OB appointment today and all is well. As usual, first thing I did was pee on a stick. I finally found out that this checks for sugar and protein. I don’t really know what the colours mean on the stick, but one stayed yellow and the other turned slightly green. All I know was that it was all good. Next, was the weigh in. I’m up 4 lbs since the last checkup. That’s about 12 lbs in my pregnancy so far. Following that was the BP check and belly measurement – the Fundal Height. Laying down, the doc measured from the top of the uterus to the top of my pubic bone in centimeters. This should be roughly the same number as the gestational age. It’s a quick check on the growth of the fetus and can help point out things like breech births, gestational diabetes causing a larger baby, etc. And finally, we listened to the baby’s heartbeat. The best sound in the world. It’s been over 2 weeks and I’ve been feeling these “bubbles” and “butterflies” daily. I’m convinced it’s not gas. It’s the little one and it’s a great little feeling! On Friday, I went in for my 19 week anatomy ultrasound. After 45 minutes of images taken, the technologist was ready to call hubby into the room to finally reveal the gender. She started by saying the baby was very co-operative and the first image she took was a gender one, which means one sure thing — it’s a boy!! 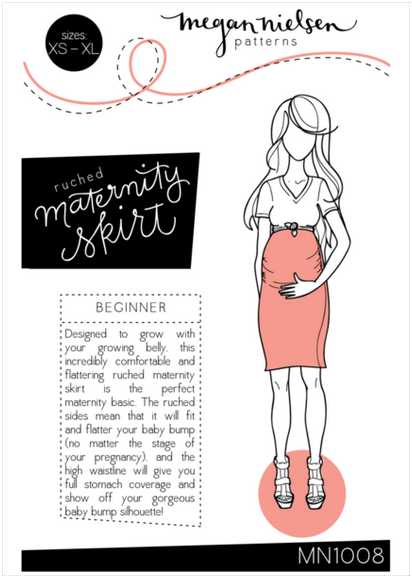 Motherhood Maternity is having an online exclusive sale right now. I jumped on it quickly and my purchase arrived in the mail today! I get so excited when there’s a delivery :) I do a fair bit of shopping online because it’s quick, easy and cheaper (you just have to search — that’s the time-consuming part). If you’re willing to invest a little bit of time online, there are some great deals out there. Make sure you’re on a legit site. This is an obvious one. If you’ve never heard of that company before, do some looking around first. Also, keep in mind that some vendors have different US and Canadian sites. This could change some of the inventory and shipping costs. Find out the shipping options and costs. If the vendor is local, you might even be able to pick it up yourself to save on shipping costs. Also, consider the shipping couriers they use, e.g., Canada Post, UPS, FedEx, USPS, etc. If duty and handling charges are involved, these prices may vary depending on the courier. Find out the exchange/return policy and costs. There are some sites that offer free exchanges and returns, i.e., you don’t have to pay for shipping costs. There are also some that allow these transactions at stores so you don’t have to go through mail. Just make sure you don’t get stuck paying to return something. Most of the time, the initial shipping costs aren’t refundable so why would want to pay twice? Look for coupon/promo codes. RetailMeNot is a good site to check. Retailers also use social media to push promo codes, so check their Twitter feeds or Facebook pages. For clothing or shoes, try it on in a store first before purchasing online if possible. If you can’t, look for reviews. They will tell you if things fit small/large, the quality of the item, etc. Pay with a PayPal account. It’s free and it offers a good purchase protection for buyers. Check your payment account regularly, e.g. credit card statements or PayPal. Thankfully, my account has not been compromised with all the online shopping I’ve done, but it’s always good to check. Also, it’s good to verify the purchase charges.